6/25/15 TriRock Philadelphia: Waddya mean no swim? In my quest for USAT Elite card, one of the Olympic distance races with a qualifying prize purse was the TriRock Philadelphia event. One of my high school buddies, and a former basketball teammate as far back as 2nd grade, is Jasper Liu, who goes to school at Penn in Philly. I knew I could stay at Jasper’s place, and he could help me get around Philly and tour the bike course with me. It would be great to see him anyway. After the terrible weather at Collegiate Nationals, I was in the mood for a serious race with a fast field, and this could be it. But, as luck would have it, heavy rains drenched Philly for most of the week leading up to the race. Unfortunately, that meant tons of pollutants washed into the river, making it unsafe to swim in. Since swimming is my best leg, I would have no particular advantage in a bike-run duathlon, and was not likely to make the podium. Also, upon arriving in Philly I realized my rear disc tubular was flat so I went thru the trouble of trying to get it fixed but ended up renting a wheel from a local shop. The race was a time trial start from transition with each person leaving about 10-15 seconds behind each other. Having said that, you have to go hard the entire race no matter what because you never know where everyone started relative to you. 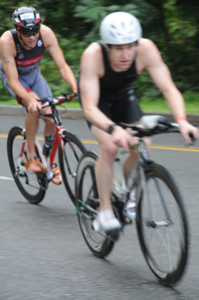 Even worse, guys who aren’t as good swimmers would get the advantage of riding in the front group because the swim didn’t cause any separation and quite honestly it was a major draft fest with two or three guys doing most of the work up front. I rode a 57:51, for the bike leg but it ended up being less than 25 miles because the pros were directed to ride the entire course but age groupers weren’t. Also, the age groupers ran an entirely different run course than pros. We had to run through more grass and mud and they actually ended up running a bit less than 10k. So there was no good way to compare my performance to guys like Cam Dye, who won. My run was a 34:57 (5:38 pace). My combined time of 1:33:39 put me 4th in my division and 7th overall. Daniel Isaacson, a fast dude I have raced in Milwaukee and Clermont, traded places with me on the bike and run several times and then ran me down the final chute, and finished 9 seconds ahead. He started behind me and I didn’t realize this until after we had finished. That was frustrating about the time trial start! He and I had a sprint finish at Age Group Nationals in Milwaukee in 2014 as well. If I had picked up a minute on the field with a good swim, I probably could have been top 3 but on to the next one.